Legendary® Encounters: A Firefly™ Deck Building Game – Serenity. 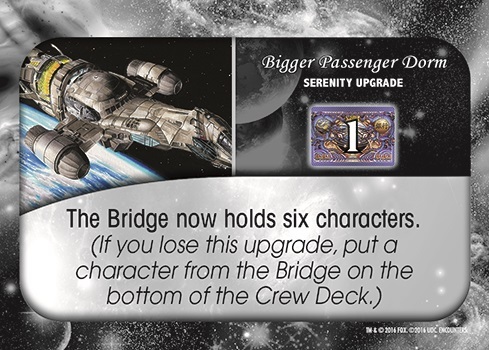 In an earlier preview the nine main characters of Firefly were shown to be playable within Legendary® Encounters: A Firefly™ Deck Building Game. In actuality there is a tenth ‘character’ in Firefly. Serenity, the Firefly-class transport ship, is used by its crew to earn a living through various legal and illegal means. It is home and it must be protected. The Episodes in Legendary® Encounters: A Firefly™ Deck Building Game take place not only planet side but also in space. This means the players will be facing off against Ship enemies. What makes these enemies dangerous is when they strike; they strike Serenity herself instead of a player. On the board Serenity is made up of four slots. When a Ship enemy strikes, a Ship Strike is drawn and placed in the lowest slot. 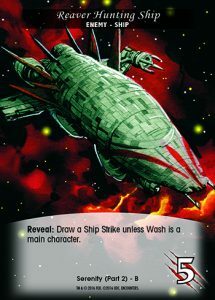 If all slots of Serenity have Strikes and another Ship Strike is drawn, Serenity explodes and the players lose the game. This makes Ship enemies especially dangerous. 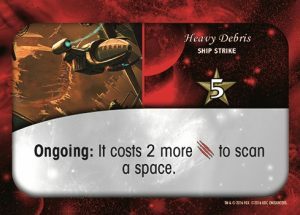 Ship enemies will strike Serenity turn after turn, eventually destroying her. Some Ship Strikes have an “Ongoing” effect that begins immediately and lasts as long as it is on Serenity. Otherwise the Ship Strike effect is followed only once when the strike is drawn. The good news is that each Ship Strike has a repair cost. A player may pay the required amount of Recruit on their turn to repair a Ship Strike. They do not have to be repaired in the order they were drawn. Players do have the ability to purchase Upgrades for Serenity in between Episodes. Players can purchase one or more Upgrade cards by paying its Credit Cost. Credits are earned during Episodes by completing Objectives or Side Jobs (more on this in a later post). An Upgrade is placed in the highest empty slot on Serenity. If there are no empty slots, players may discard an existing Upgrade to replace it with a new one. 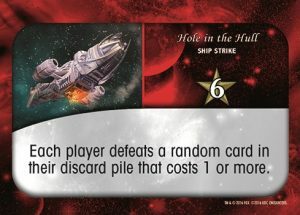 If a Ship Strike is drawn and the next slot up contains an Upgrade, the Upgrade is destroyed and the strike is placed onto the slot. Legendary® Encounters: A Firefly™ Deck Building Game releases August 10th. Contact your local gaming store to preorder your copy today.